This entry was posted in Mental Health, Recovery & Support and tagged Co-Occurring Disorder, Managing Symptoms, Treatment, Trust on August 24, 2016 by Team Addiction Hope. Animals have a way of providing unconditional love, never passing judgment on humans for their many mistakes. Humans and horses have shared a special relationship for centuries. The bond between horses and humans derives from several similarities, such as our social nature and family systems. Therapists find that connecting recovering addicts and mental health patients with horses can aid the healing processes. Equine-assisted therapy is a hands-on form of treatment that has great potential when employed alongside traditional forms of psychotherapy and rehabilitation. Several treatment centers in the U.S. have seen stunning progress with patients who participate in equine-assisted psychotherapy. Encouraging patients to bond with horses on the farm challenges the treatment recipients to view the world and themselves differently. This form of therapy centers the patients, helping lower their heart rate, blood pressure and stress levels. 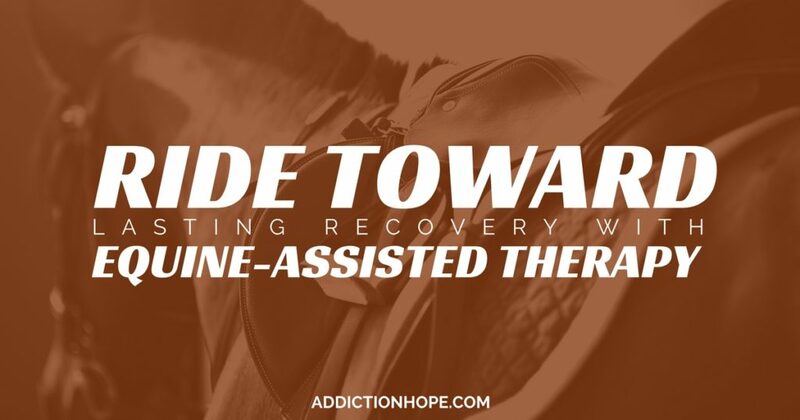 Difficult-to-achieve recovery goals come a little easier to patients who connect with the horses during equine-assisted therapy. When a person suffering from mental health problems slows down, looks into a horse’s eyes and has the opportunity to take care of another intelligent living being, the process fuels remarkable breakthroughs. Equine-assisted therapy helps these patients develop skills for a healthier lifestyle, such as how to appropriately identify and cope with feelings. Horses help strip away feelings of depression and anxiety, leaving room for patients to feel other, more positive emotions. With this clarity and enlightenment comes helpful recovery epiphanies. Many people with mental health illnesses and/or addictions have been conditioned by their experiences to believe that feelings are a bad thing. They cannot cope with their thoughts and feelings, and thus turn to substances. Equine-assisted therapy doesn’t require patients to use their minds to solve problems. Instead, patients rely on their hearts and feelings during their sessions with the horses, learning how to react in the moment in a healthy way. When used with traditional therapy sessions, equine-assisted therapy can be incredibly beneficial. Horses are more sensitive to emotions than other animals. Someone afraid of horses, for example, can put the horse on edge. If someone is angry or aggressive, the horse can react with stubbornness. When someone who is calm approaches, the horse responds similarly. This open reaction to emotions can help those recovering from drug or alcohol addictions see themselves more clearly, and help them work toward making an inner change. Instead of feeling like an outcast, patients feel needed and important. Taking care of and spending quality time with a horse promotes self-awareness and non-verbal communication skills. It encourages patients to improve themselves first, and then work on improving interpersonal relationships. Equine-assisted therapy provides a safe environment in which recovering addicts and people with mental health issues can face their fears and overcome roadblocks. It allows for more in-depth processing of feelings and emotions, and it helps people develop the confidence to address larger life problems. All around, the horse and human bond is a promising supplement to traditional therapies, one which catalyzes recovery and puts people back on the right path. RiverMend Health’s Bluff Plantation in Augusta, Georgia is one of the few treatment centers in the country to offer equine-assisted therapy. To learn more about RiverMend Health, click on the button below. Which alternative form of therapy do you think best helps mental health patients and people recovering from drug and alcohol addictions? Please weigh in below.